Wow. That looks retarded to anybody looking at it. It seems so obvious. It’s like some kind of joke. Hard Enough for One Man to Carry and be Expected to Shoot while Standing a Belt-Fed LMG, adding another Awkward 10-15 Pounds of Load is just.. retarded. (or 6.5) SAW-Type Belt-Fed for the Squad’s Suppression Weapon. 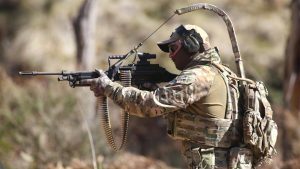 You are currently reading "This Crazy Contraption Was Supposed To Help Aussie Troops Carry Their Guns, It Did The Opposite", entry #20763 on The Captain's Journal. This article is filed under the category(s) Army,Australian Army and was published March 17th, 2019 by Herschel Smith.